With a stay at St Francis Inn in St. Augustine (St. Augustine Historic District), you'll be steps from St. George Street and 3 minutes by foot from Old St. Augustine Village. 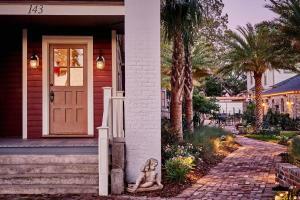 This bed & breakfast is 0.4 mi (0.6 km) from Cathedral Basilica of St. Augustine and 0.4 mi (0.6 km) from Lightner Museum. Make yourself at home in one of the 17 individually decorated guestrooms, featuring DVD players and flat-screen televisions. Complimentary wireless Internet access keeps you connected, and cable programming is available for your entertainment. Bathrooms have showers and hair dryers. Conveniences include ceiling fans and irons/ironing boards, as well as phones with free local calls. Pamper yourself with onsite massages or enjoy recreation amenities such as an outdoor pool. 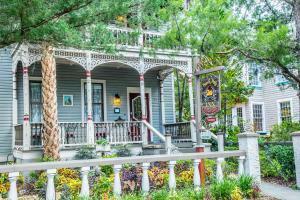 Additional features at this bed & breakfast include complimentary wireless Internet access, gift shops/newsstands, and wedding services. Mingle with other guests at the complimentary reception, held daily. A complimentary buffet breakfast is served on weekdays from 7:30 AM to 9:30 AM and on weekends from 7:30 AM to 10:30 AM. Featured amenities include complimentary newspapers in the lobby, luggage storage, and coffee/tea in a common area. Event facilities at this bed & breakfast consist of conference space and a meeting room. Free self parking is available onsite. When would you like to stay at St Francis Inn ? Some hotel guestrooms are located offsite, 2 -6 miles from the main property. Guests booking a stay in Harbor 26, Beach Bungalow, Beach Cottage, and Beach House – A and B sides room types should contact the hotel directly for more information. Guests can contact the office using the number on the reservation confirmation received after booking via this Web site. Each day we'll check prices and send you an email for your selected dates at St Francis Inn. If you don't have specific dates but would like to check prices for say next weekend or say next month we can check the price too. Click to write a review and share your experience of St Francis Inn with other travellers.